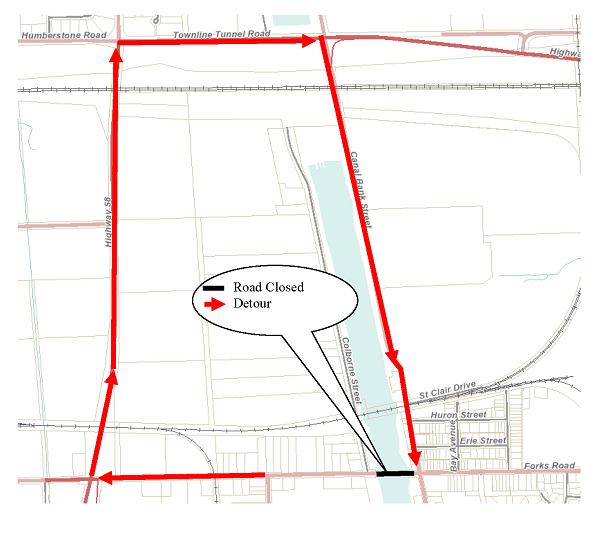 The City of Welland closed Forks Road Bridge on Friday, November 2, 2018, at 9:00 a.m. to ensure public safety. A thorough inspection of the bridge deemed the structure not safe; therefore, staff made a decision to restrict vehicular access but allow for pedestrian access. On March 19, 2019, Welland City Council awarded the Forks Road Bridge demolition contract to Schouten Excavating. Demolition work is expected to begin shortly. On water training for Waterway user groups is permitted in designated areas only. Updates regarding the Forks Road Bridge will be added to the City of Welland public engagement platform, https://yourchannel.welland.ca. The online project is available for public feedback and information sharing. City staff will be bringing forward a report to the April 23rd General Committee meeting that will provide an update on potential funding sources and replacement options. On November 26, 2018, staff from the City of Welland met with City Councillors from Ward 6, officials from Niagara Regional Police Services, Niagara Regional Emergency Medical Services, Welland Fire and Emergency Services along with four (4) members of the Dain City Bridge Committee. Engineers continue to analyze the rate and extent of the corrosion in order to estimate a timeline for the bridge’s ongoing ability to support pedestrians and ultimately its own weight. Due to the extent of corrosion, rehabilitation of the structure has been deemed to be an impractical and significantly cost-prohibitive alternative when compared to replacement. Bridge replacement alternatives and cost-estimates have been developed. Maintenance plans have been developed, and approval is expected shortly from the St. Lawrence Seaway Authority to utilize canal service roads as an emergency detour route (EDR) in the event of a catastrophe. Locked gates will be installed shortly at the eastern end of Forks Road to permit access by emergency personnel only. Emergency response times remain within the guidelines. City crews will ensure EDR is maintained and plowed to municipal standard to ensure a timely response by Fire, Police, and EMS. In the event of an emergency, and if there is a train on the tracks, dispatch have been instructed to contact Trillium Railway’s operations manager to clear the track. Invitations have been mailed to all businesses and homeowners in Dain City notifying them of a Public Information Forum being held on Tuesday, December 11, from 5:00 – 6:30 p.m. at Civic Square, 60 East Main Street, in the Community Room. City staff will make a presentation to Welland City Council at the December 11, 2018, General Committee Meeting, starting at 7:00 p.m.
Welland City Council will consider options to address the Forks Road Bridge issue during the 2019 Budget deliberations in January. Another public open house will be held to inform the public of the details and timelines associated with the selected option. Information will be added to the city’s public engagement platform, Your Channel, https://yourchannel.welland.ca on Wednesday, December 12, 2018. Residents will be able to engage in the conversation and voice their concerns and thoughts on the future of the Forks Road Bridge. For more information, contact the City’s Engineering Division at 905-735-1700 ext. 2204 or 2221. This is to notify you of a Public Information Forum that will be held on Tuesday, December 11, 2018 at the Civic Square, 60 East Main Street in the Community Room from 5:00 p.m. to 6:30 p.m. regarding the status of the Forks Road Bridge Closure. This will be a casual open-house drop-in session with staff and Engineering Consultants on hand to answer any questions you may have. You are encouraged to come and join us to learn more about the safety concerns, traffic detour routes, and options under consideration moving forward. April 18, 2016 – Close up inspection of the Forks Road Bridge found significant corrosion of structural steel supporting members. An immediate 5 tonnes maximum load restriction was posted. The bridge was constructed in 1930. The lift bridge was decommissioned in 1973 and the towers were removed in 1997. The City was downloaded ownership in 2000. Bridges are inspected every two years and the Forks Road Bridge was last inspected in Fall 2018 A Load Capacity Evaluation was conducted on the structure following inspection. A Public Open House will be held in the near future once engineering reports are received, analyzed, and options are determined. Information about the condition of the Forks Road Bridge, potential options, and estimated costs will be provided. Bridge engineers and City Engineering staff will be in attendance. City of Welland Council and staff understand the significance and impact that the Forks Road Bridge closure has on the public and are approaching it as a priority. Future updates will be provided as information becomes available.